Tomatoes are rich in antioxidants, loaded with vitamin C and beta-carotene. I try to take full advantage of their freshness during the peak of their season! So many varieties and colors are available, aren’t they gorgeous! 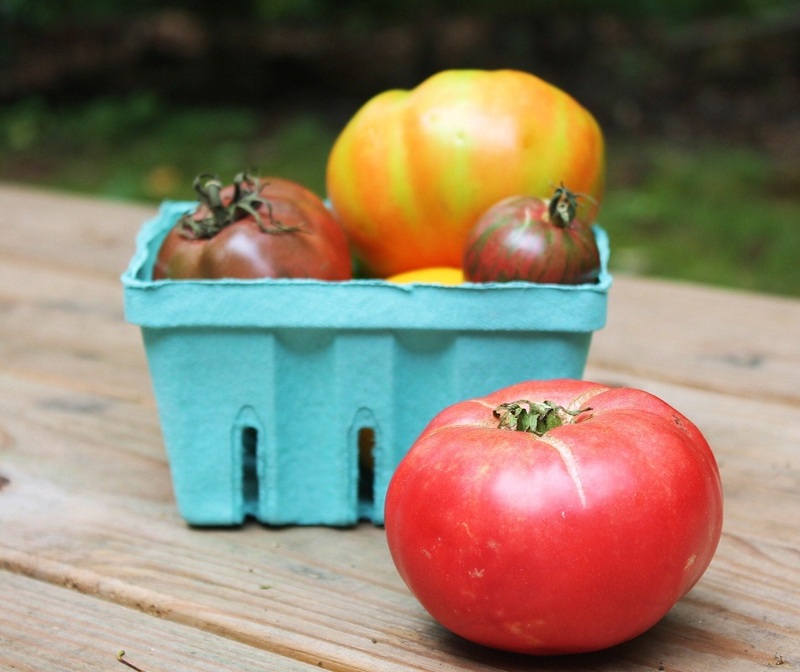 I have been receiving the most beautiful and tasty tomatoes in my CSA bag each week. This pie, which originally I had intended to be a tart came to my mind a few weeks ago. However, my tart pan is still packed away since the move, so I had to make due with what I had on hand. 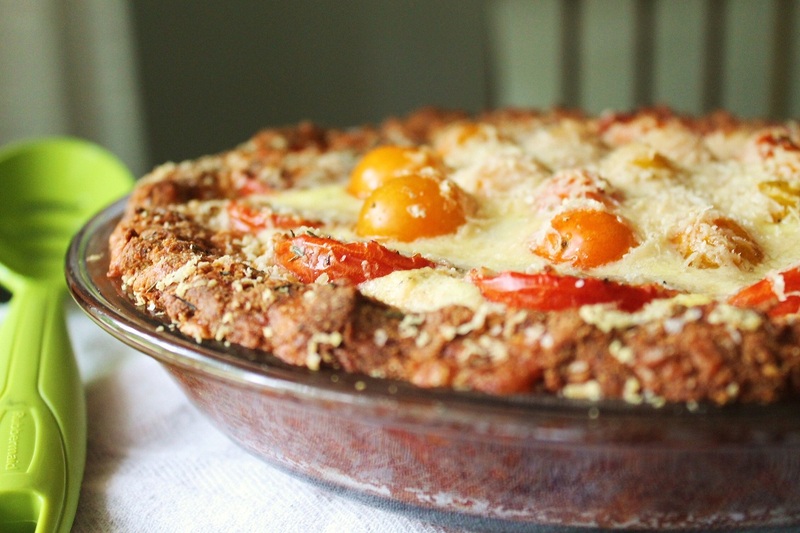 It’s a cross between a deep dish pizza and savory pie. The crust is none other than my cheddar biscuit recipe and it’s filled with ripe tomatoes, feta, herbs, garlic and topped with parmesan. 1 sprig thyme, leaves removed from stem. Prepare crust by following the cheddar sage biscuit recipe (I omit the sage for this particular dish). Press raw dough into a 9 inch pie plate. Set aside. Stir together egg, feta, mayo and garlic. Pour into crust. 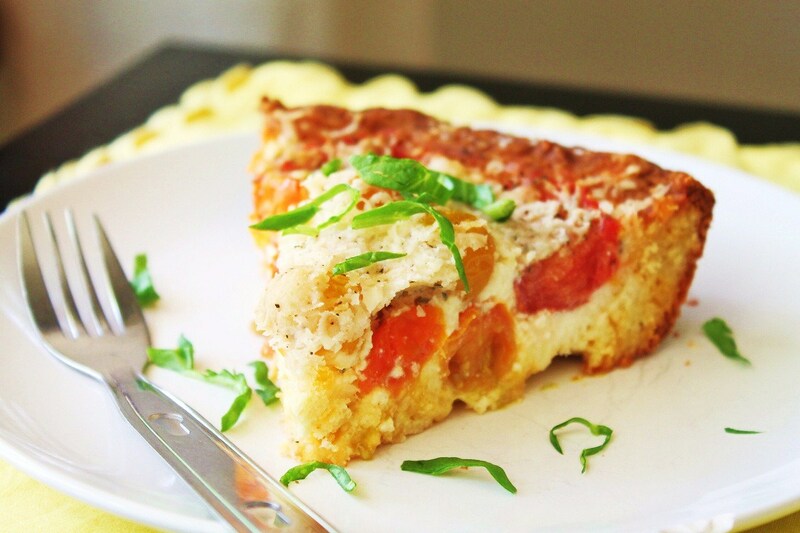 Arrange tomatoes on top of egg mixture. Season well with salt and pepper. Sprinkle with parmesan cheese and thyme leaves. Bake at 325 for 50-60 minutes. (if it gets too dark during baking, turn down to 300 halfway thru cooking time). It’s your fault I’ve been spending too much time in the kitchen! ;-) Thanks for the great recipes! One can never spend too much time cooking, especially if you love it and love good food :) You are so very welcome for the recipes, I’m glad you like them! I wanted to mention too that I believe I read in your ingredients tab that you don’t know how almond meal (as opposed to flour) would work in your recipes. I’ve made a number of your recipes with great success using homemade almond meal. I soak all my nuts, seeds, etc as I have absorption issues, so I soak, dehydrate, and grind mine. They aren’t as fine as commercial flour, but I still manage to get it pretty fine. The texture has been very nice, and I got rave reviews. 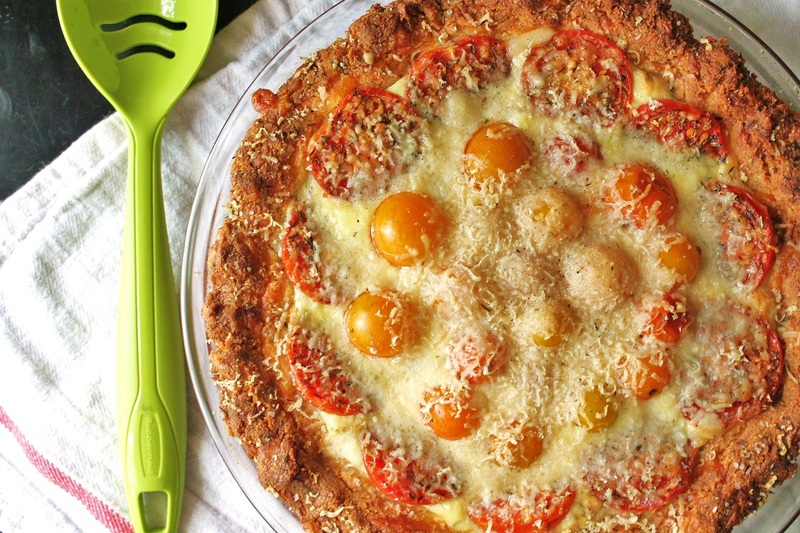 Hi — this looks fantastic and right now I have a million tomatoes, so perfect timing. If you have to make a sub for the feta, would DCCC work okay with it, do you think? Also, I happen to love sage and have a lot of it as well — do you think it would clash with the taste of the filling? DCCC would work just fine! I think sage and thyme still work together just fine. Or just do sage, if that is your preference. Let me know how it turns out! Came out amazing. My guests were very impressed, too. I also made the plum cake, which was just delicious. The crust looks amazing! My mouth is watering right now… The combo of parmesan and feta sounds delicious, and I am excited to see from the comments that DCCC could sub for the feta. It is dry curd cottage cheese or farmer’s cheese. It’s virtually lactose free and a great alternative to feta. Have you tried freezing this so it could just be reheated later? If not, do you think it would work? Thx for all the great recipes! Hi! I would like to invite you to check out our site http://www.volrecepten.nl . Adding your blog to our site will make your recipes available to many more users. I’ve made this a couple of times so far and am in the process of making it again right now. It’s such a great simple dish with so much flavor!! Oh and I’ve added chunks of an organic artichoke & kalamata olive sausage to it which works perfectly! Thanks so much for all your great recipes!! !